In this unstable economy, growth can sometimes cost your organization more money than it makes. When a warehouse becomes overcrowded, it is necessary to either add space or move to a new facility—something almost no company can afford to do at the present time. Pallet racks offer an equivalent and much more cost effective alternative to moves and expansion, and are perhaps the one material handling investment that carries with them the most assured return on investment. Everything about a pallet rack is designed for efficiency that translates directly into improved organization and process flow and return on investment. Space consolidation causes a three-dimensional expansion in storage area. Because pallet racks convert both floor space and vertical cube space into consolidated storage areas, they represent a three-dimensional expansion within the four walls of an existing facility. We cannot stress enough to our clients how important this is to their inventory control and safety protocols. Cluttered floor space is a hazard to workers and an obstacle to fork trucks and pallet jacks. Cleaning up these areas can improve your organization’s safety rating and make it possible to manage your inventory more efficiently and accurately. Knowing exactly what you have, where it is, and how to find it makes it easier to managed books and avoid double purchasing and over purchasing something you may already have but were not able to locate until after the fact. Organizing materials on a pallet rack keeps them in better condition. When things are stored haphazardly, they are not only a threat to human safety, but stand in greater risk of being damaged themselves. Organizing them on a pallet rack keeps them off the floor and away from feet and moving equipment. This reduces both replacement costs for damaged inventory, and it decreases the time involved in finding parts, supplies, small equipment components, and products ready for shipment. Pallet racks in this sense are a time clock’s best friend, because with workers being able to more quickly access what they need, the need for overtime is reduced—if not complete eliminated. Every Easy Rack Pallet Rack is custom built to the exact requirements of a facilities industry, storage needs, size, and process flow. There is nothing generic about the way we sell pallet racks. Even when we sell used racking materials or racking systems, the finished product is a custom pallet rack made exactly for what the client needs. Used pallet racks can save companies up to 40% off an invoice and can be custom built from components we have access to through nationwide procurement channels. New pallet racks can also be custom built in the same manner, of course. Regardless of your choice for used or new racking, getting what you need is easy with Easy Rack. 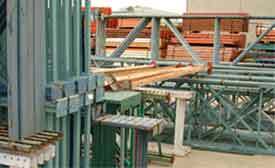 A material handling specialist will carefully gather all the necessary information we require to calculate what type of pallet rack you will need. This information includes such things as square footage, ceiling height, the industry you work in, the type of materials you will be storing, and a general estimate of the size and weight of pallets can containers you will place on your racking. With this raw data, we can calculate the horizontal and vertical dimensions of your rack and provide a weight capacitance that ensures safe storage. We do this for you so you can simply give us the information and wait for your new warehouse storage system to arrive.